We probably talk about end-of-world events just about as much as any other topic around here, which isn’t a big surprise. First, we’ve been in a horror the past couple years watching world events (especially here in Dumb America), so it always feels like the ax is about to drop. Second, we cover a lot of dark, shadowy music, so the subject comes up a lot, mainly because artists also are reading the tea leaves. 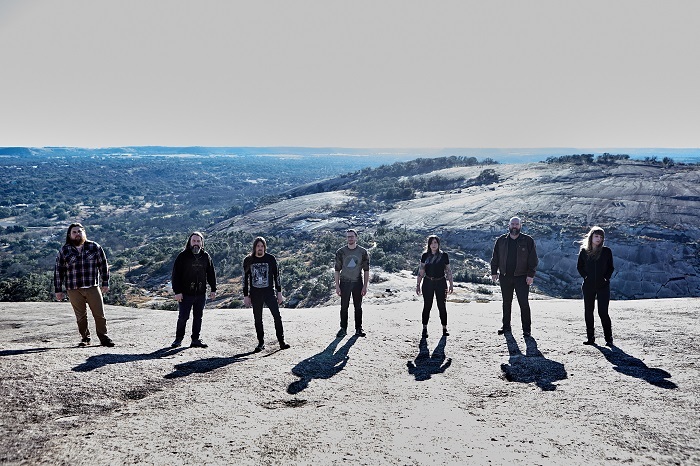 Dallas, Texas, apocalyptic metal band Dead to a Dying World hardly are new to the party when it comes to imagining and maybe predicting the horrors that are ahead. In 2011, they delivered their self-titled debut record that began a planned triptych of albums that would cover the sixth extinction of the Anthropocene, the one that would claim all of us. 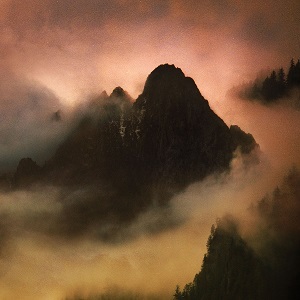 That continued to 2015’s “Litany” and now culminates on their expansive, breath-taking new record “Elegy” that is the perfect end-of-tale exclamation point on a tale that doesn’t end well for humankind. On this album, we see a post-human world and a story that revolves around loss and grief as a new ecological system takes form and life begins again. It’s another compelling chapter from this group—vocalists Mike Yeager and Heidi Moore, viola player Eva Vonne, guitarists Sean Mehl and James Magruder, bassist John Schiller, drummer Josh Dawkins—as they stretch out their atmospheric doom with strains of western American sounds, progressive rock, and metallic sludge that never sounded as good as it does here. In addition, there are key guest performances from Thor Harris (ex-Swans, Thor & Friends), Jarboe (ex-Swans), Dylan Desmond (Bell Witch), Emil Rapstine (The Angelus), Pablo C. Urusson (Sangre de Muerdago), and Tim Duffield (ex-Sans Soleil) to help flesh out these cinematic pieces. “Syzygy” opens the record like a desert-dry tale, with guitars crawling along and Yeager’s deep crooning feeling dusty as well. “Let the cool, clear water cleanse my spirit,” he urges, as harmonies swirl behind him, bringing desolation to mind as he ends with, “To the firmament, return to dust.” “The Seer’s Embrace” then bursts out of that with growls and shrieks melding, strings scraping, and the tempo flowing across the land. The atmosphere is gazey, while clean singing emerges, elegant guitars glimmer, and then shrieks return for more. After some quick bursts, the tempo is pulled back while more vocal harmonizing floats overhead, savage wails strike, and the track surges into space. “Vernal Equinox” is quiet at first with a desert vibe as Jarboe’s powerful singing takes the lead, and then sludgier notes pound away. As the song goes, the drama kicks into higher gear, the intensity strikes, and the track melts into the night. “Empty Hands, Hollow Hymns” starts with an intro by Urusson, as acoustics dance, crashing into echoes before the song fully opens up. Growls rain down as the band digs into a thrashy sequence, and from out of that comes a nasty progressive bend that should light up your heart. Growls and shrieks again team up while strings get roused before a dose of calm is delivered. The drums rumble while the song is torn apart, and the final strains burn out into dust. “Hewn From Falling Water” has freezing guitars that work alongside a wall of singing that feels ghostly, while strings slice, and the end gives you some rest to prepare you for 14:36-long closer “Of Moss and Stone” that simmers in quiet while chimes ring out, and gazey thunder strikes. Then, the storm begins to rage, vicious shrieks send jolts, and compelling melodies lie prone in the beating sun, letting their surface burn. Jarboe moves in and takes control of the plot, mesmerizing before the next eruption bursts, and the emotions smother. Growls punish, the band deals its final shots, and the song is devoured by a noise cloud that mars sanity as the track screeches away for good. The events depicted on “Elegy,” as well as those on the other Dead to a Dying World albums, may seem a great distance in the future, but its seeds have long been planted, and potentially are coming to harvest as we take each breath. That adds even more power behind this amazing six-track, 49-minute album that never lacks for drama, heart, and wrenching emotion. It seems silly to call this band forward-thinking since they’ve been at it for nearly a decade, but considering hardly anyone has caught up to them, perhaps we really are all behind the frontline of this band’s enthralling vision.